We all know that pugs shed like there is no tomorrow. Fawn pugs and some black pugs have a double coat and shed twice as much as single coat pugs do. And there really isn’t a way to stop the shedding. Not even shaving your pug will stop it, it merely makes the hairs shorter not less and can cause other health problems. 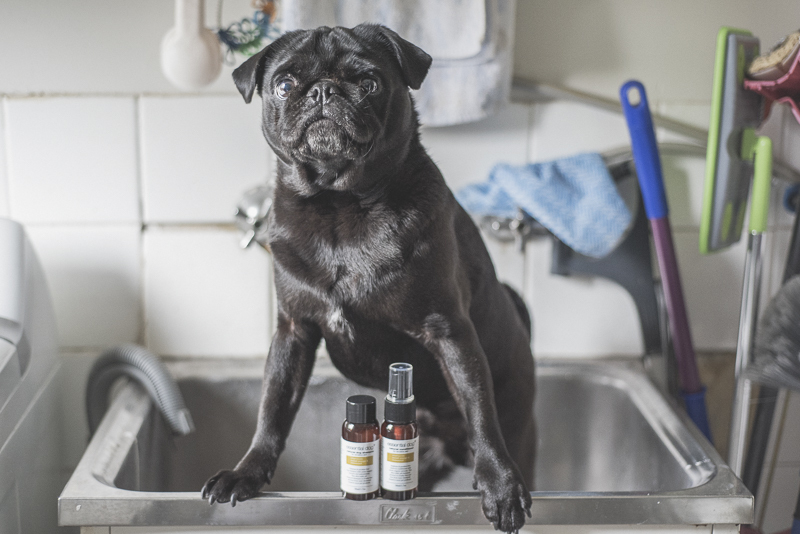 But I am here to help with my 3 tips for minimising pug hair around the house. The best way to reduce the amount of pug hair around the house is to simply brush your pug every day for at least 15 minutes. You’ll be amazed at just how much less hair will float around the house with a daily brushing. Start with brushing their head and make your way down to the tip of their tail. Make sure to brush their sides, belly and neck. There is no part of the pug body that is free from shedding so brushing all over is a must. My tip is to brush your pug outside to avoid extra cleaning up inside. Brushing can be set aside everyday as quality pug time. The Zoom Groom by Kong is not just any old brush. It is a magnet for pug hair. Made from rubber, it not only removes loose hair, it massages your pug at the same time whilst being gentle. This massaging stimulates capillaries and natural oil production for healthy skin and a healthy coat. 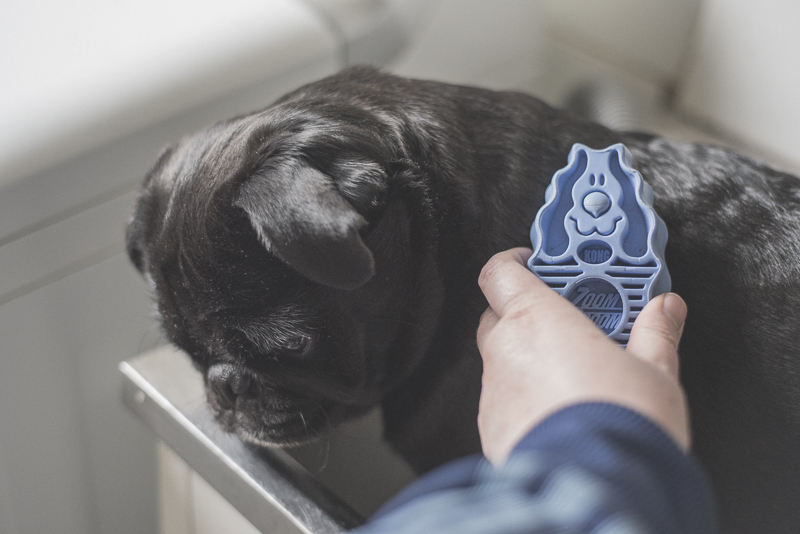 The Zoom Groom is also perfect for brushing whilst bathing your pug, helping to remove loose hair during bath time. Bonus Use: The Zoom Groom is also great for removing excess pug hair from your clothing after brushing your pug. As much as your pug may hate to be bathed, it is actually really good for minimising the amount of pug hair floating around the house. Pugs shed the most during and after a bath. The good thing about this is that you can be on top of it all when it happens. A really good brush before bath time is great to loosen all of the pug hairs. Bath your pug with a pet hose that has a built in brush that will help remove loose hairs whilst washing them. Alternatively, use your Zoom Groom during bath time to help remove those hairs. Choose a shampoo and conditioner that is natural and will be great for your pug’s coat. Once your pug is nice and dry, another really good brushing is essential to remove the rest of those loose pug hairs. It is recommended that you bath your pug every 3 weeks even if they are not dirty. This will help remove all of those hairs so they don’t get trapped in their coat. Essential Dog products are the best natural shampoo & conditioner on the market with no ingredients being harmful to your pug. They are specially formulated to be gentle on your pugs skin whist cleaning their fur and still retaining their natural oils. They are perfectly designed for all dogs and are especially great on those with sensitivities. They also contain aromatherapy blends that are gentle and designed for their aromatic properties that help to promote a pleasurable and relaxing bath time for both the dog and human. There are a range of shampoos and conditioners for those with sensitive skin and normal skin as well as one for puppies and adults to share. They also have deodorisers for in-between bath times and who doesn’t love a bit of doggie cologne. You are going to be vacuuming regularly so you might as well have a good vacuum to get the job done well. Not all vacuums are created equal and designed to pick up dog hair from a range of surfaces. So choosing a vacuum with top suction is a must. In our home, we have been using Dyson vacuums for years due to their superior performance and reliability. They have proven to be the best choice in vacuum for us especially since getting Ref 5 years ago. And over the years with the animal vacuums coming out, it means that us pug owners now have a better solution for cleaning up pug hair around the house. 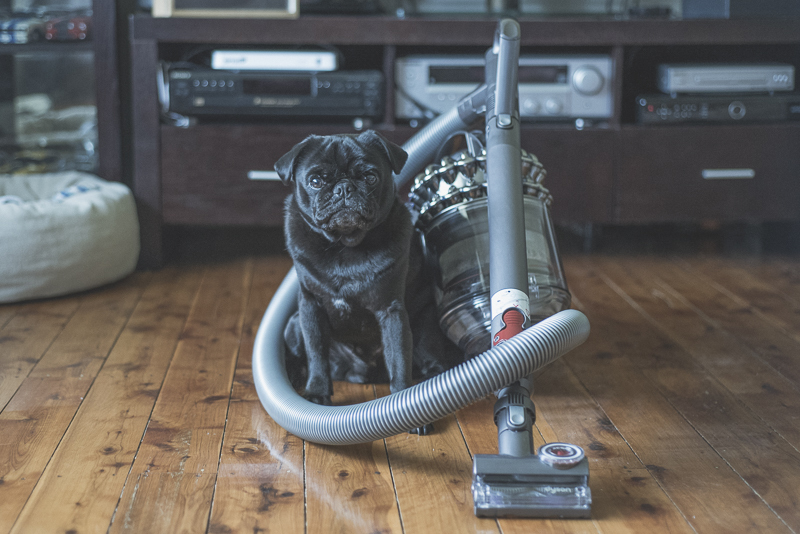 Regular vacuuming is a must to prevent the pug hair embedding itself in surfaces like the lounge, carpet and beds. The Dyson Cinetic sciene whereby the Dyson Cinetic tips capture the dust and pug hair that normally clogs up filters and bags in regular vacuums. No additional costs as it has no bags or filters to replace when they are filled with pug hair. The ball technology is an upgrade on previous Dyson models as it is now designed to effortlessly follow you around the house. Not only does it move better, it is also lighter making it better for those who may have back or limb pain. The tangle-free turbine tool will be your best friend as it is perfectly designed to remove loose pug hair from upholstry. This is a new design on their previous upholstry tool making it 100 times better at removing pug hair from lounges, chairs and beds. The soft dusting brush is a new attachment to the older Dyson we have had for years. It now makes dusting so much easier and more effective by removing the pug hair from other surfaces rather than just moving it around. It works wonders on lamp shades. It comes with standard tools like the Tangle-free turbine tool, stair tool, swivel hard floor tool, soft dusting brush, flexi crevice tool, combination accessory tool, stubborn dirt brush tool and the turbine head that is suitable for hard floors to carpet. The Dyson DC54 Animal Pro is approved for allergy sufferers as it expels cleaner air than any other vacuum. The biggest problem area in our house for pug hair is actually my bed as Ref spends more time in my bed than anywhere else in the house. 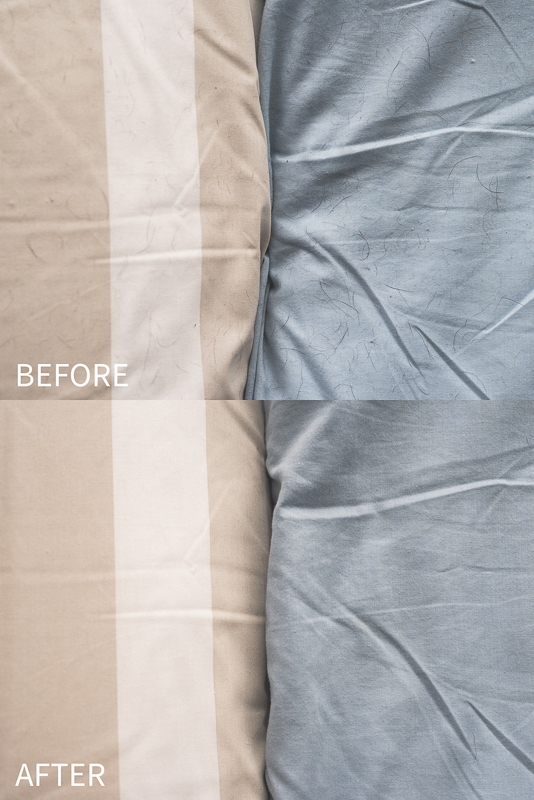 Check out this photo showing what Ref’s pillows look like on my bed normally and then after using the Dyson DC54 Animal Pro on them. What other tips would you give to help minimise the amount of pug hair around the house? Do you have a favourite grooming tool to use? What are the health problems with cutting/ shaving the pug hair ?? I hope this helps you Jacinta. Love my Dyson and love Essential Dog too ? Haven’t tried the ZoomGroom though! You should definitely try the Zoom Groom. It really is great. We love our Dyson Animal DC65 and use it daily. Works great in the car too! Thanks for stopping by Karen. Dyson’s are definitely great vacuums. Hi Chloe! Unfortunately I haven’t used a brushing mitt to be able to recommend one. I do love the ZoomGroom for everyday brushing as it is gentle and good. When it comes to a deshedding tool, I have only just started using the Furminator and have found to it be great at getting hair out. Just keep in mind that a deshedding tool should only be used say once a month so not to irritate your pug’s skin as the prongs are sharp metal. But one good brush with the Furminator and regular brushing using something like the ZoomGroom will be very effective. The Furminator can be purchased on eBay for a lot less than RRP. Thanks for stopping by and I hope this information helps you.